The Homeschool Gossip: Harry Potter Week Monday ~ July 31st - August 5th at the Main Library in Statesville! 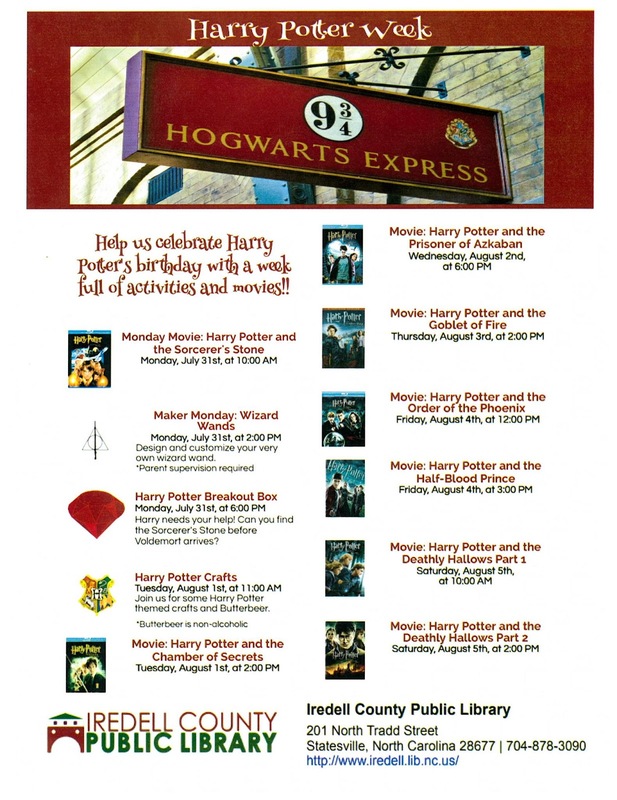 Harry Potter Week Monday ~ July 31st - August 5th at the Main Library in Statesville! Harry Potter Week is happening Monday, July 31st - Saturday, August 5th at the Main Library in Statesville. Enter for a chance to win a complete set of Harry Potter books. All you need to do is like our Facebook page, share this post, and comment below and tell us what you love about Harry Potter! We will draw a winner on Monday, August 7th! Harry Potter Week is made possible by the Iredell Friends of the Library. Help us celebrate Harry Potter's birthday with a week of activities and movies!! 6:00 PM - Harry Potter Breakout Box - Harry Potter needs your help! Can you find the Sorcerer's Stone before Voldemort arrives?